This giveaway is now CLOSED. Many thanks to our wonderful sponsor The Good Cheer Company! We would love to work with you again! Congratulations to 'johnica1' (we post our winner usernames instead of full names, this is why it's in quotes) the winner of Ascending Butterfly's Piece of the Puzzle Affirmative Jewelry Giveaway! Remember: There are still some great giveaways active on the upper right hand side of the page! Have you found your piece of the puzzle yet? Earlier this summer I entered a giveaway at Coupon Queens of Laurel Run, (now known as a shoppers quest) and I was fortunate enough to win, shortly after winning I also saw this product featured on the Ellen DeGeneres talk show and I was on pins and needles until it arrived. There was a chain of coincidences starting with my win that led me to Ron the owner of 'The Good Cheer Company', could the name possibly be more perfect for a collaboration with Ascending Butterfly? 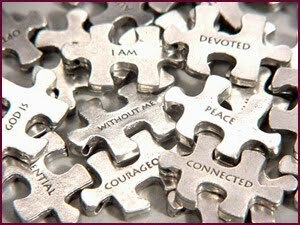 Our mission statement is to seek out and share the best sources of inspiration both on and offline, and I have to say The Good Cheer Company's Piece of the Puzzle Affirmative Jewelry is perfectly in line with our mission statement! There are 41 Puzzle-Shaped Pewter Tokens to choose from! They are great gifts to remind someone special in your life who they really are, what they mean to you and to help inspire and motivate them to be the best they can be in so many different areas of life. You can also empower and show some love to your beloved pets by purchasing 'The Pet Affirmation Tag' - these can all easily be attached to your dog or cat's collar. Or your pet lizard or snake, if you put collars on them! These are perfect family stocking stuffers! These are amazing gifts for family, friends, colleagues, how many of you are part of a secret santa this year at work? It is difficult to find gifts that are reasonably priced (and most of the time secret santa restricts you and gives you a very difficult spending cap to work with), deceptively simple and powerfully meaningful, but with Piece of the Puzzle you get all of the above! Piece of the Puzzle is our first Holiday Buying Guide Editor's Pick! It meets the criteria of all savvy holiday buyers this season - great price point, the total opposite of a generic gift, amazingly meaningful, and just plain FUN! For these reasons, this is where our holiday buying guide begins. We will be introducing our holiday buying guide editors picks up until and right through New Years Eve! Check back daily to be sure you don't miss a thing!! Please follow directions or you will be disqualified! All comments are moderated, they may not appear on the site right away (comments like "I want this or I want to win" will not be entered). You have from Thursday, November 12, 2009 until Monday, November 23, 2009 at 11:59 PM (EST) to comment and be entered for a chance to win. Winner will be announced shortly after Wednesday, November 25th! * Put our button on your blog and send us the link to the page where we can see it. I would love to win "Unique". I am now a follower Tracy (I can see my pic!). I am a follower (username Auriette). I love several of the affirmations, but my very favorite is I AM / IMAGINATION. auriette at tmlindsey dot com. I am a follower. My username is johnica1 and my favorite affirmation is I Am Abundance. I am a follower. My username is kimberlynelson79. My fave affirmation is I AM/Blessed. My email is kimberlynelson79@gmail.com. Thanks!!! I'm a google follower and I would choose "wisdom." This is great! I like the I AM IMAGINATION. Thanks for the giveaway! I follow your blog and I AM "VALUABLE"
I love I am BLESSED. My favorite is the I AM/ FEARLESS necklace, thanks! I voted for you in the Downy contest. My favorite is I am/ unstoppable. It would help me get through the day and achieve my dreams. Following you on Twitter. Somedaynewyorkr.